A package of some marijuana infused gummy candies that were seized during a seat belt stop in Stamford on Saturday. STAMFORD — A couple of patrol officers conducting a seat-belt stop got a little more than they expected when they uncovered two packages of cannabis-infused gummy candy on Saturday. Officers Jonathan Gale and Matthew Romano conducted a motor vehicle stop after observing the front-seat passenger without a seat belt at about 5:30 p.m. on West Park Place. As the officers walked up to the car, they could smell marijuana and the passenger, Kenny Segura said he had some. The driver and Segura were taken out and searched and a small amount of marijuana on Segura was allegedly discovered as well as a plastic bag with some pot was found in the passenger door pocket. 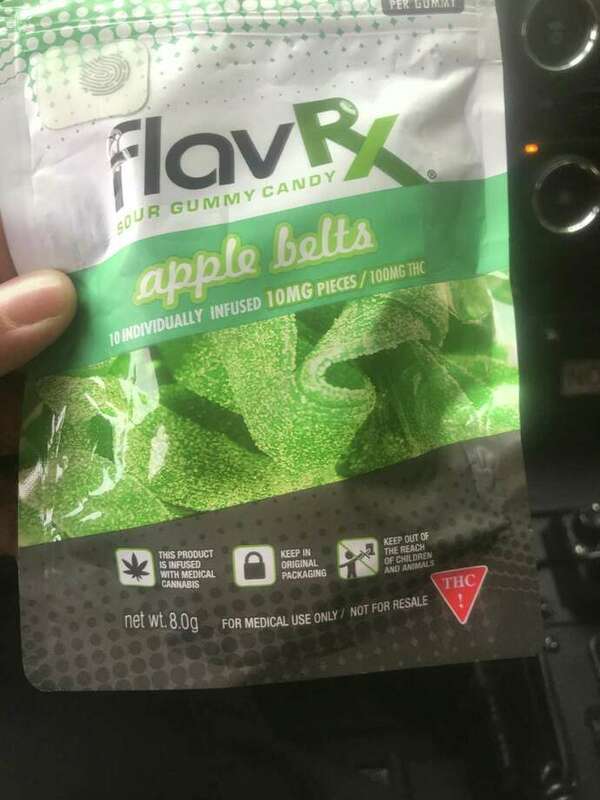 But when the officers checked the trunk, they found two packages of FlavRx sour gummy candy infused with 10 milligrams of Tetrahydrocannabinol, the active ingredient in marijuana. Each bag had 10 apple-flavored candies in it. The marijuana weighed 18 grams and the gummy candy weighed 15 grams. Segura took ownership of the marijuana and the candy and was charged with possession of marijuana, possession with intent to sell and failure to wear a seat belt. Candies like those seized are legal for recreational sales in some states.